A-Bun-Dance Bohemian Bazaar presented by Grateful Generation. 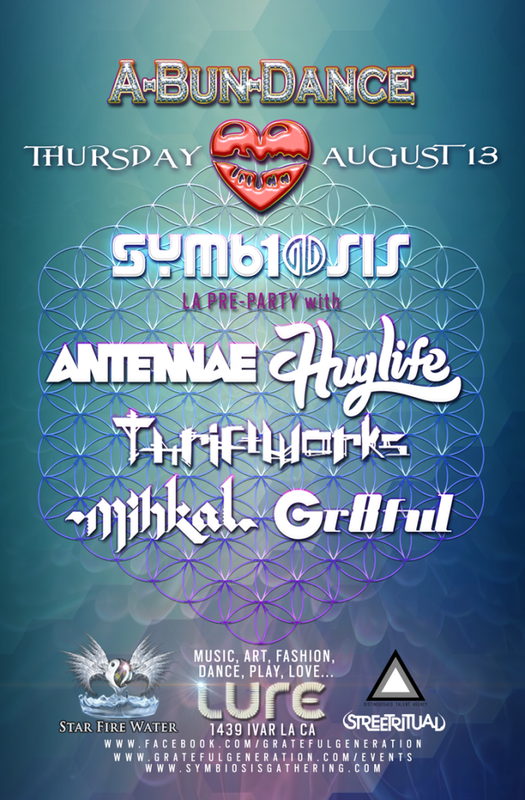 Join us on August 13th for the Symbiosis Los Angeles Pre-Party featuring An-Ten-Nae, Thriftworks, Huglife, Mihkal, and Gr8ful at Lure Nightclub. A Bohemian Burner Bazaar like no other…Come inspire, and be inspired by amazing music, phenomenal live artists, performers, cosmic cupids, vivacious vixens, galactic goddesses, glittery kittens, belly dancers, stilt walkers, massage, vendors, organic treats, and festive drinks. Get a jump on your Holiday Gifts too!